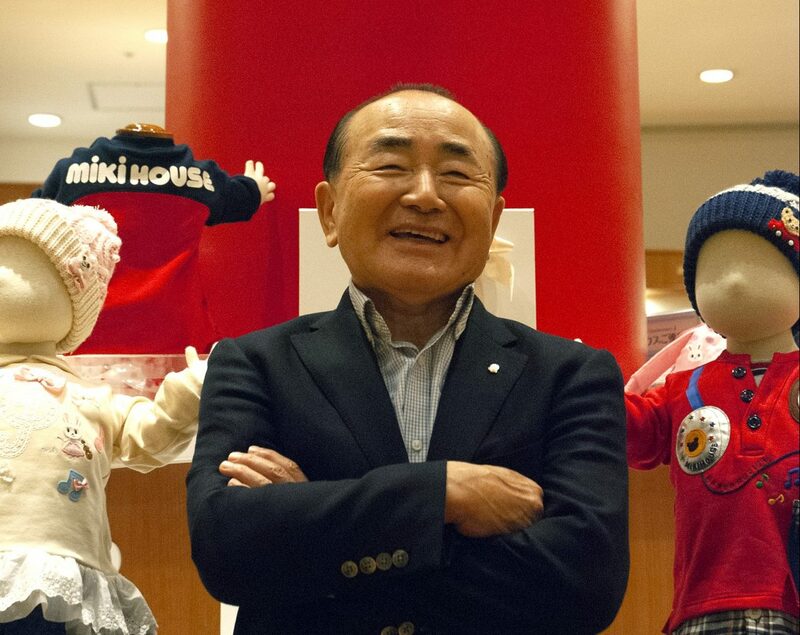 From milk deliveryman to CEO of an international kids’ clothing brand, Kansai native Koichi Kimura knows a thing or two about building a business from the ground up. Founder of MIKI House, a global fashion brand since 1971 with its origins in Kansai, Mr. Kimura sat down with us at his Yao headquarters to talk about how it all began. MIKI House has grown into a global brand since you started it nearly half a century ago. Did you set out to achieve this, or has it happened organically? There was never a plan per se. I have always stuck to my core beliefs and played the cards I was dealt with. When I first started, out I simply wanted to support my family. It wasn’t about setting out to make a global operation at all. Things just took their natural course. A lot of the decisions I made along the way were often a matter of fortuitous timing, and perhaps a little bit of destiny. What made you enter the business of kids’ fashion? When I began, my wife was pregnant and had gone off to live with her mother—as is the custom in Japan—leaving me with a lot of time on my hands. Kids’ clothes were obviously on my mind, but the quality of items available was often poor, or unattractive. Everything had to be bought in separate stores. Shoe shops, swaddling shops, outdoor-wear stores, etc. I saw a gap in the market for a range of baby and kids clothes that were totally coordinated. A hat and a pair of shoes to go with a dress for example—all matching or complementing each other. I bought material and hired local housewives to sew the patterns for me. In those days, every household had a sewing machine and often a highly skilled pair of hands to operate them. The quality of their samples was astounding. I knew I was on to something. Why do you think you have been so successful where others have failed? Probably because of my single-mindedness! I was delivering milk in the early mornings to subsidize my new business in the early days, getting up at 4:30 am to do my round and then back to work on my clothing business during the day. I traveled all over Japan, working my way up from Kyushu with my samples and knocking on the doors of prominent clothing stores in each area I visited. Once I had pinpointed the stores that stocked only the best items, I wanted them to sell my clothes, no matter what. I was refused countless times but kept going back until they agreed. If I had walked away after every knockback, none of this would have been possible. I had confidence in my products, but it was often the fact that I was from Osaka that proved hardest to overcome. “Oh, we only sell products from Tokyo…” was what I heard a lot. Changing people’s opinions was hard at first. By 1987, you had opened stores in Hong Kong, the U.S., and France. What do you think is the appeal of your products outside of Japan? The quality. It was always my mission to produce the finest quality items. That means our clothes are expensive, but I will not compromise on quality, ever. Which is your fastest-growing region outside of Japan? China is our biggest market right now, along with Taiwan and Hong Kong. The birthrate in Japan is down to just 9 million from 25 million when we started, compared to China where it is now a massive 180 million. That’s a lot of babies. How has the online shopping boom affected your business? Internet shopping is very convenient, of course. I think there is a place for both online and traditional stores, however. Most of our retail outlets are in the big cities, so being able to reach customers via our online store is crucial, especially if you simply want to exchange an item for one size smaller/larger, etc. We sell our items online, but only domestically. It is one of our growing departments. Your headquarters are in Yao city, in the southeast of Osaka prefecture. Are there any local sights you would recommend? Yao? (laughs). Apart from our store downstairs, there isn’t a lot here. When I built this building (at huge expense), and ordered the basement to be turned into a showroom/store, my staff thought I was crazy. “No-one will come to Yao!” they said. “Better to build a carpark for the workers.” But I was adamant. We had to have a flagship store, I believed. Now we have MIKI House fans coming from all over the world to shop here. There is a limited selection in the department stores, of course, but here we have the entire range.